Phillip Arrow: This is like our style where I’m from, Shageluk. I don’t know what these holes for. Eliza Jones: Maybe they had ears on there at one time. Phillip Arrow: Yes. Anyway, what I heard, Anvik had a big kashim [community house]. (2) They call it a kashim, the place they dance. We have one too up there [Shageluk] that we use. Supposed to use that building for only this kind, now they’re playing bingo and everything in that hall. Eliza Jones: So there was a special kashim [community house] just for this kind of ceremony. Phillip Arrow: Right, because this mask belongs to dead people, my mom told me. Too many guys use it, and now all those guys are dead. Yes, so we still use it. Eliza Jones: You’ve seen some like that? Phillip Arrow: I don’t know, but they used to make all kinds of masks long ago. We lost—you know those fish traps? You know how big they are? Had one full [of masks] that we lost. Eliza Jones: Oh, where they stored it? Up on a tree? Phillip Arrow: Right. That’s where mom used to tell me not to go around. Eliza Jones: At the base of the spruce tree. Phillip Arrow: Yes. I was told not to go around there, otherwise I would get sick or something. Eliza Jones: What year was this, when it was lost? Phillip Arrow: Oh, it was a long time ago. A long time ago, they made that airfield in Shageluk. Eliza Jones: Oh, that was when they put in the first short airport. That’s when the masks were lost. Eliza Jones: The nose was nailed on. Aron Crowell: There’s actually another piece, it’s the eye. And it looks like it probably goes in that side [right eye]. Does it fit in there? Judy Woods: Ivory and little stone. Phillip Arrow: I’ll bet that goes in from the bottom [back]. Trimble Gilbert: Yes, okay. You can hold it up now. You said masks belong to dead people? Phillip Arrow: That’s what they believe it. I believe it too. Trimble Gilbert: Maybe this guy lost one eye, and it was important or something, that means something. Phillip Arrow: It’s got to. They had a reason why they did that. Kate Duncan: How did the dancer keep the mask up? Did they tie it or hold it? Phillip Arrow: There’s one hole on there for rope, and they use flour sack rope. Eliza Jones: And then tie it at the back? Phillip Arrow: Yes. The ones lost in Old Shageluk, some of them were made out of elephant [mammoth] bone too. Never rot those. Eliza Jones: There’s a groove up here [at top] too, so there was something up there. 2. The word kashim comes from the Yup’ik word qasgim, a form of qasgiq “community house” (also called “men’s house”), which was used for dances, feasts and sweatbaths and is called a trał tth’et in Deg Xinag Athabascan (Phillip’s language). 3. The word for kashim “community house” is kkuskkuno in Kouykon Athabascan (Eliza’s language). This is one of several masks from Anvik that collector George T. Emmons identified as images of the Up River People, mythical beings from the mountains who were portrayed in the Deg Hit’an Mask Dance, or Giyema. (1) Such masks had long faces and mouths that were usually (but not always) made round to signify that the mask was crying. 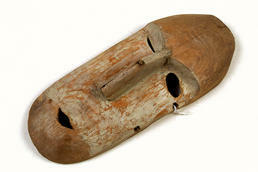 Some had large, pegged-on ears, and holes on the sides of this example suggest that these were once present. The Mask Dance, Bladder Festival, and other ceremonies that were held each winter by the Deg Hit’an in their villages along the Yukon, Innoko, and upper Kuskokwim rivers were unlike those of any other Athabascan group. (2) On the other hand, these ceremonies were very similar to those of neighboring Yup’ik communities with whom the Deg Hit’an had close and generally peaceful ties, and from whom they apparently adopted many customs. (3) Notably, Deg Hit’an ceremonies took place in a kashim, or community center and adult male residence that was nearly identical to the Yup’ik qasqiq [men’s house].